The European Union and other fishing nations of the International Commission for the Conservation of Atlantic Tunas (ICCAT) will discuss a potential drastic increase in the total allowable catch of East Atlantic and Mediterranean bluefin tuna at a meeting next week (14-22 November) in Morocco. Rome – Brussels – The European Union and other fishing nations of the International Commission for the Conservation of Atlantic Tunas (ICCAT) will discuss a potential drastic increase in the total allowable catch of East Atlantic and Mediterranean bluefin tuna at a meeting next week (14-22 November) in Morocco. WWF strongly warns against any rapid increase in fishing quotas that would impair the full recovery of the tuna population. 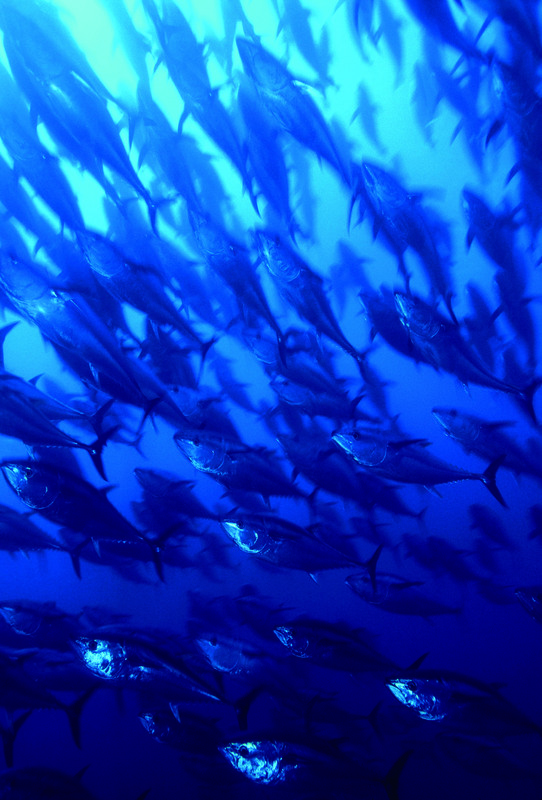 After a struggle of more than 10 years to save and sustainably manage the bluefin tuna threatened stock, the ICCAT scientific committee is suggesting an increase in the total allowable catch up to 36,000 tonnes by 2020 (more than double the 2015 quota), while at the same time declaring that the stock has not yet recovered. The same scientists are also warning that such a catch level would potentially decrease the bluefin tuna population in coming years. In addition, the European Union is proposing to interrupt the recovery plan, adopted in 2007 and supposed to end in 2022, so 5 years before the original deadline. WWF warns that this will open new negotiations and change management measures, leading to weaker management of the bluefin tuna population. "Bluefin tuna stock is not yet ready to support such a rapid increase in catches and would suffer from less strict management. It took us more than ten years to bring bluefin tuna back to our seas, and we cannot lose it again for short-term profit" declared Alessandro Buzzi, Fisheries Projects Manager at WWF Mediterranean. "The measures adopted for the recovery of the species are generating very positive results, with bluefin tuna no longer being overfished. We urge governments to build on this success and wait for the complete recovery of the species," he added. WWF recommends a quota of 28,000 tonnes by 2020 to allow the population to continue to grow and calls for a continuation of the recovery plan until the stock is declared recovered by scientists. In addition WWF asks for nations to allocate higher quotas to small-scale fisheries, which have been almost excluded from access to the resource for the last ten years, provided that the current monitoring and control standards are ensured. WWF also warns about the unknown impacts of Illegal Unreported Unregulated (IUU) fishing, suspected to be still prevalent in the Mediterranean. "Rebuilding the bluefin tuna stock was a huge challenge. We need to learn from the past and be patient until the stock has finally recovered. This should happen soon, if we continue to apply best practices." Atlantic bluefin tuna is a large predatory fish found in the western and eastern Atlantic and the Mediterranean Sea. Most catches are taken from the Mediterranean, and this supports the most important bluefin tuna fishery in the world in terms of amount of catches and quality of fish. The millennial bluefin tuna fishery in the Mediterranean entered a phase of rapid and intense deterioration in the last decade of the 20th Century when the new practice of farming wild-caught tunas multiplied without control to feed mainly the Japanese sushi market. This generated a perverse overfishing spiral, with huge IUU (Illegal Unreported Unregulated) fisheries levels. WWF was the first to warn about this new threat and since 2001 has led an international campaign to avoid the collapse of the bluefin tuna population and to ensure a rational and sustainable fishing activity in the Mediterranean. A recovery plan for the species was adopted by ICCAT in 2007. It sets rules on several management measures among which total allowable catches, fishing season duration, minimum size, by-catch management, recreational fisheries. It also defines measures regarding monitoring and control, reporting of catches, caging and transferring operations. ICCAT is the International Commission for the Conservation of Atlantic Tunas, a regional fisheries management organisation (RFMO). Established 51 years ago, ICCAT is composed of 51 Contracting Parties which have the mandate to monitor and sustainably manage the stocks of tuna and tuna-like species in the Atlantic and Mediterranean.